Sulfur is a naturally occurring mineral, and the third most abundant in the human body behind calcium and phosphorus. In the body, it is a necessity for proper synthesis of proteins and enzyme, vitamin conversions, joint health, metabolizing amino acids, hair, nail, and skin health, and more. What Does Sulfur Do for Hair? Sulfur is often referred to as one of the building blocks of hair, with good reason. Our hair is comprised of a durable protein called keratin, which is high in sulfur content. Sulfur is required for proteins (like keratin) to maintain their shape, which contributes directly to the overall health, strength, and elasticity of hair. More exciting is that there are studies indicating that sulfur has positive effects on hair growth. The life cycle of your hair consists of 3 phases: growing, resting, and shedding. Sulfur has been proven to lengthen the growing phase of your hair. A longer growing phase (before resting and shedding) means longer hair. Lastly, sulfur also has been linked to treating, relieving, and decreasing the occurrences of psoriasis, dandruff, eczema, and folliculitis. I personally find the growth benefits and scalp relief to be pretty amazing. I've been taking MSM regularly since I began transitioning, and I attribute it to supporting and encouraging healthy hair growth. You can check out my growth and progress pictures out at www.maneobjective.com or on Instagram @maneobjective. I recently began using two products from The Pomade Shop (which you'll see later) on my scalp, and both have definitely helped relieve some of the scaling and flakes I get with my scalp psoriasis. How Do I Get the Benefits of Sulfur? Or, you could always take MSM (Methylsulfonylmethane), which can be found at any health food store, and even Trader Joe's. This recipe works best when mixed and applied using an applicator bottle. If you are going to roll with the DIY sulfur recipe listed above, be mindful that sulfur does not dissolve in oil. You will need to shake up the applicator bottle before each use. Most importantly, some people report allergic reactions to using sulfur on their skin, especially at higher concentrations. Do not use more than the amount recommended above. 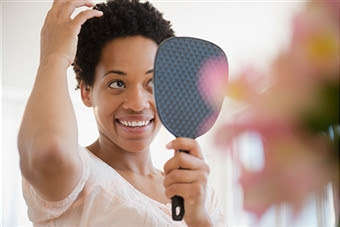 Before applying to your entire scalp, do a patch test in an inconspicuous area to test for sensitivity. You can always take the cautious approach and start off with half of the sulfur required for the recipe or less, and gradually increase the amount. Have you ever used sulfur, or products containing sulfur to grow your hair? Share any favorite recipes as well! Good to know about this hair care. Would be great if u share some more tips that are suitable and easy for everyone.